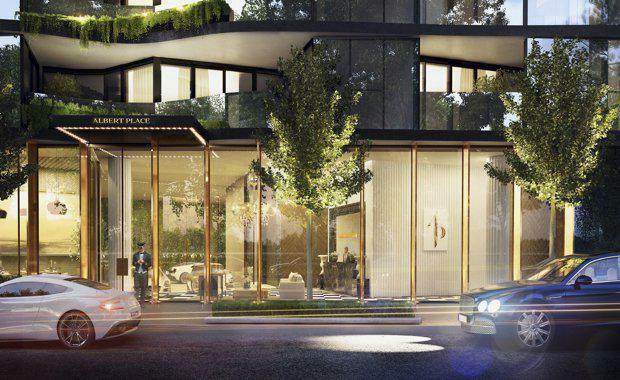 Property Developer Gurner has announced the impending launch of its newest Melbourne project, ‘Albert Place Residences’, which consists of 156 luxury apartments boasting impeccable views over Albert Park Lake. Albert Place Residences was designed by collaborators who have worked with Gurner before: architects Elenberg Fraser and interior designer, David Hicks who was primarily responsible for the project’s interiors, amenity and lobbies. Jack Merlo was engaged to design the ground floor and vertical garden life that will drape from each balcony, cascading down to the ground level. 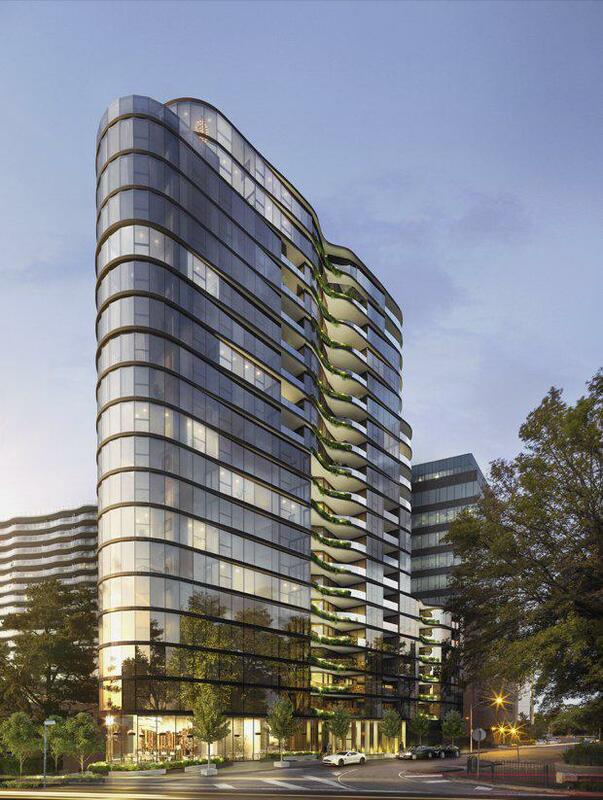 Rising up over 20 levels, the project's fortunate corner positioning provides all apartments uninterrupted views across the CBD, bay and Albert Park Lake to the north or panoramic views across the Lake to the south. Albert Place was inspired by Gurner Founder Tim Gurner's love of New York City and in particular, the 5-star hotel luxury that is expected as standard along the Upper East Side. Gurner said Albert Place Residences was designed to exude a sense of ‘old world’ charm, style and sensibility that New York’s luxury hotels are so well known for. Standing tall on a triangular site in a fluid, curvilinear form not unlike New York’s famous Flatiron building, future residents will be greeted by a full time concierge and valet service before entering a lobby adorned with black marble, scalloped columns, timber herringbone walls and a feature floor made from checkered black Nero Marquina and white Carrara marble. “We have designed the lobby to provide an arrival experience like no other," David Hicks said. 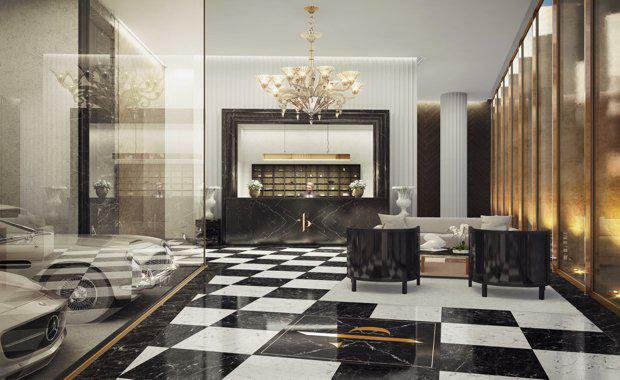 Once inside, residents will be greeted with 'The Prince’s Club' - a moody, New York-inspired long room, lounge area and cards table, framed by a library, pool table and wine cellar with 52 individual wine lockers for owners, holding over 2,500 bottles of wine. On the level above, combining elements of traditional Turkish baths and modern private health clubs, The Prince’s Baths features a full-length lap pool, sunken spa, sauna and lounge area with open showers and change rooms. The apartments were designed to feature custom gold or silver chrome tapware and custom joinery, natural stone benchtops and splash backs with optional Miele or Gaggenau appliances and recessed coffered ceilings featuring LED strip lighting throughout. Herringbone timber flooring can be selected as an upgrade along with stunning custom TV cabinetry and a custom breakfast bar to the balconies. For those seeking another level of luxury, Albert Place includes a penthouse collection that offers all upgrade options as standard, along with Gaggenau appliances, double length kitchens, between three and four bedrooms, spacious double-height entertaining areas with dramatic voids, and private plunge pools. In what marks a shift towards savvy owner occupiers, Gurner designed the project with a preference towards two and three bedroom apartments, signifying the demand from local downsizers who are looking to move on from the large family home. “Our research and past project successes in South Melbourne has indicated that downsizers are the largest and most active demographic in this local area right now," Gurner said. “These astute buyers do not want to share lifts and amenity with students or the like, so we have increased the average sized apartment to 86 square metres with the average price positioned at well over $850,000, to specifically target the more sophisticated market demographic. “This, coupled with the unheralded number of three bedroom apartments, allows purchasers to know that they are in good company, ensuring the longevity and quality of the building for years to come," he said. “Our buyers are selling the large family home, and seeking to downsize into an apartment that will suit their lifestyle. This is our third project in South Melbourne in the last two years. “Understanding our market is the key to creating projects that stand the test of time. We could have easily fit more than 230 apartments on this site but chose instead to pare it back to 156 and focus on more spacious, luxury offerings that would meet the market’s exacting demands,” he said. The project is set to launch to the market in the coming weeks, and Gurner are preparing for VIP and other customers alike by investing significantly in the display suite. Gurner have reportedly spent around $1 million on the suite's fit out. According to Gurner, such a move was made "in order to adequately convey the unrivalled dedication to luxury interiors, fittings and finishes throughout".